PDCA is the core activity of management. This was introduced to Japanese in 1954 by Deming. 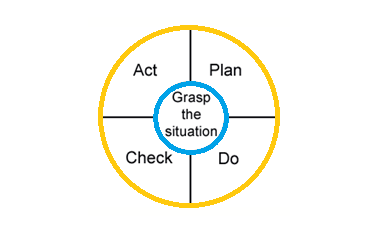 Grasping the situation to develop problem consciousness is required at each step of PDCA cycle. PDCA an acronym for PLAN, DO, CHECK, ACT. PDCA acts as a strong foundation to effective industrial functioning as it is simple and powerful. PDCA ensures continuous improvement & results in achievement of higher degree of success. Step 2: Formulation of Communication plan- Since the process involves continuous improvements, communication becomes vital. Communication is required to update every team member and also those that are impacted by the results. Every person involved needs to know the status of the project undertaken. Hence a story board or a project report or a KPI need to be placed in an easily visible prime location facilitating effective communication. During the PDCA process, the team may address more than one root cause and may also test more than one way to deal with the root cause. This phase involves understanding and analyzing the present situation. It also investigates the nature of problems and works on seeking solutions to the same. During the course of investigation a team can find many problems and quality improvement opportunities. Grabbing these opportunities and reviewing the process yields solutions in the further processes. 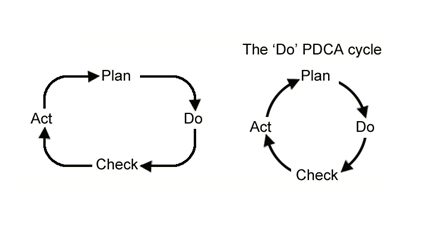 DO contains its own PDCA cycle. This reflects its importance. The purpose of this phase is to implement the action plan developed in the Plan Phase. This allows us to strengthen and confirm our plan before full implementation. In what manner to check ? This phase involves in analyses of effects of Plan and Do. Compare new data to the previous data to check improvement & its accordance with the goal/target set. Check is a phase to analyze and compare and document basic method improvements implemented. Go-see is also important in checking rather than hear-say or paper reports. This is a summation of the previous three phases & aims to act upon what has been learned in these phases. Make counter measures if outcome results are substandard. permanent counter measures, which address the root cause. PDCA is a data based powerful format to achieve improvements in efficiency .performance, accountability, outcomes that are indicative of quality which the customer demands. Part#1: What is Lean Manufacturing Technology?